Saving Money – Sanitiser (required for every spa) is produced for FREE from salt conversion. Saving Water – Compared to Chlorine Free spas, that require water dumping every 3 months. See why our customers bought a salt water spa. Can any Spa be a Salt Water Spa? Everybody knows that salt is corrosive for metals and as such superior materials are required for our exclusive salt water spas. Salt at the correct concentration will not damage our superior Shells, Jets, Pumps and Other Equipment. 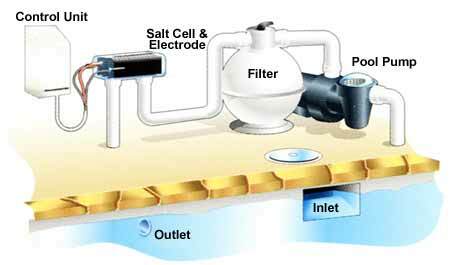 How a Salt Water Spa System Works? Every time the filtration cycle is engaged the chlorinator turns salt into the sanitiser for free. Salt is sodium chloride (NaCl). Through a controlled process in a low-current electrolysis cell, chlorination is produced in just the right amount to sanitize spa water. As salt water enters the cell, a safe, low-voltage current passes between special rare-metal plates, producing pure chlorine (Cl) from the saline solution. In water the chlorine instantly becomes hypochlorous acid (HOCl), which is its disinfecting form. In conjunction with its control unit and programmable timer, the cell will sanitize any size spa. It is incredibly efficient, using only about as much energy as a 50-watt light bulb, often running less than an hour a day. You’re probably wondering how often the salt needs to be replenished. One of the beauties of these systems is that as the hypochlorous acid is used up, the chlorine recycles back into salt. So with a salt chlorine generator, the salt only has to be topped up occasionally due to spa water splash out, and replenished when the water is changed. Very economical! Gentle to hair, even coloured or blonde – No more green hair! While some marketers tout salt systems as chemically free, that’s really not honest advertising and misses the point. This is a world of chemistry, and life itself could not exist without chemicals. Salt is a chemical. Water is the most common chemical on our green Earth’s surface! Salt systems are an advanced method to utilize natural chemistry in a better way. Many people previously convinced that they had an allergic or other aversion to chlorine, found no such problems after switching to a salt-based system. Perhaps the additives in packaged chlorine were more to blame. In any case, a salt system allows the user to more precisely control the sanitizer output, often requiring lower levels to achieve water purity. The mineral salts have many health benefits of their own. Another benefit is the spa owner doesn’t have to dump water as often compared to chlorine free or traditional chlorine / bromine systems. Less dumping with a salt water spa saves you time and money. You do not have to refill (water and chemicals) and heat the spa from scratch. Salt is sodium chloride (NaCl). Through a controlled process in a low-current electrolysis cell, chlorination is produced in just the right amount to sanitize spa water.